WHILE LICENSED TO OPERATE, the anaerobic digester located at the Central Landfill in Johnston and built by Blue Sphere Corp., is still not operating anywhere near full capacity, citing issues with cold winter weather. / COURTESY BLUE SPHERE CORP.
JOHNSTON – Anaerobic digestion was meant to be the answer to Rhode Island’s 2016 food-waste ban, but more than six months after the licensure of a digester in Johnston meant to generate 3.2 megawatts of electricity, the state’s first, and so far only, facility of this type, there is no such industry to be found. This is not the first time New England’s climate has been cited for delaying the facility’s operational status. Providence Business News at the time reported industry experts, including Earth Care Farm, the state’s sole licensed commercial compost plant, and R.I. Resource Recovery Corp. representatives, expressed concern the energy company would meet its self-imposed deadline. In fact, a year later, the early 2016 deadline long passed, the facility’s opening had been pushed out to an undetermined future date, according to a statement from Blue Sphere at the time. Blue Sphere Corp. did not return multiple requests for comment. DEM’s associate director for environmental protection, Terrence Gray, said the facility is online but only “accepting a limited amount of materials” while it finalizes testing. While DEM could not state when the anaerobic digester first went online, records reflect construction on the site began in 2015, and it was awarded a license to operate on Nov. 15, 2017. DEM did not immediately return requests for information on the state’s anaerobic digester request for proposal process. In early 2016, when the state’s food-waste ban went into effect, entities which produced more than 102 tons of food waste per year were now required to redirect those materials from the landfill to “an authorized, composting facility or anaerobic digestion facility.” The reason is that the state Central Landfill is expected to reach capacity by 2034, which does not leave a long time period for the buidling and licensing of a new state landfill. As of July 2018, the anaerobic digester is one of two facilities licensed to accept food waste, the other being Earth Care Farm, a composting facility in Charlestown. However, the ban was designed with a clause which stipulates that if an authorized facility is not able to accept materials, which is the current situation at the anaerobic digester, food waste generators will not be required to abide by the regulation and could continue to direct food waste to the landfill. 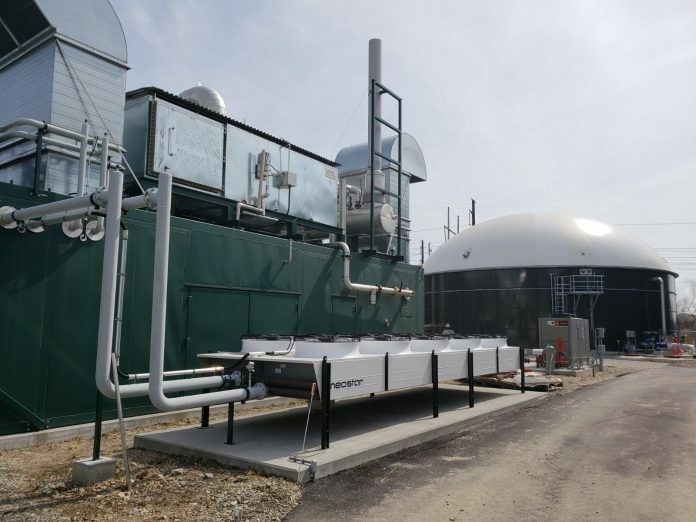 Regionally, Connecticut and Massachusetts are also developing anaerobic digestion industries. There are five anaerobic digesters across Massachusetts, per an October 2017 Mass. Department of Environmental Protection map, one of which is located in New Bedford. One anaerobic digester is operational in Connecticut, and has been online since December 2016, with two others under construction and a fourth on the docket. Emily Gowdey-Backus is a staff writer for PBN. You can follow her on Twitter @FlashGowdey or contact her via email, gowdey-backus@pbn.com.